This website is the result of over 10 years spent trawling through microfilm at the State Library of Victoria (SLV), and countless hours online searching the Trove and Google News digital newspaper archives as well as the SLV's digital archive of the Football Record/AFL Record. Ray Mooney - for reminding me that writing can be fun. John Devaney - for his ongoing determination to tell Australian football fans the full story of our great game. Pat & Michael McGoldrick - for their encouragement and suggestions throughout the research and writing process. Damien Green - for the use of images from his website, Aussie Rules Collectables. Michael Riley - for his detailed advice on website design. Andrew Robinson - for his extensive research of VFA results and ladders, especially the early years that were neglected for far too long. Armin Richter - for providing missing Grand Final dates, Lightning Premiership scores and the names of some representative captains/coaches. 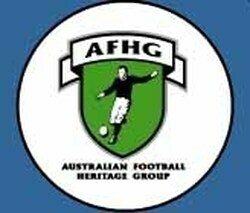 Gerry Walsh - for creating the "VFA Footy: The Halcyon Days" facebook page. It was discovering Gerry's site that re-ignited my interest in the VFA after many lost years. Thanks also for his help with missing Grand Final info and names of some representative captains/coaches. James Hothersall - for providing scans of old Football Recorders as well as vital information on the Premier's Cup and VFA Pre-Season Cup. Marc Fiddian - for his dedication to the VFA and his two written histories of the Association that served as an invaluable reference for this section of the site. Terry Keenan - for his list of every Port Melbourne player, which revealed the first names of some early VFA representative captains. Wal Williams - for providing the missing dates of a number of representative matches, including the obscure 1947 game against Bendigo. "vfa" and "cobrascorer" - two of the forum posters at www.vflfooty.com who provided missing Grand Final info, first names of leading goalkickers, etc.